WAFFLES: So you're probably wondering why I'm all dressed up today like it's a special occasion and all. Well it IS Waffles Wednesday, you know. But did you know it's also National Dress Up Your Pet Day? That doesn't mean you have to wear a DRESS though. 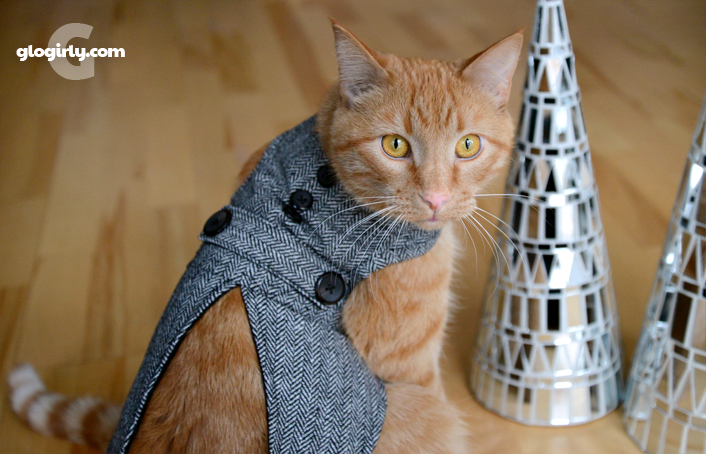 I figured the ladies would like to see me in my fancy coat and tails. But not all cats like to play dress up. The Boss, well... even though she's got her own closet, she's not a fan. But I don't mind it at all. There's usually some freeze dried chicken involved in dress up. Look for outfits that are fashioned like a harness with a simple strap that fits around the neck and the tummy. Avoid anything that has to go OVER the head or ON the head. The only hats and wigs I like to wear are magic Photoshop ones. Avoid outfits with dangly stuff like bells and ribbons. Some cats (not me of course) will try and pull them off and eat them. I don't mean really good eyesight. Don't ever leave us alone when we're dressed up. Make sure we only wear our outfits for a short amount of time so we don't get too hot. Not all cats like dressing up so don't ever force us to wear something...even for a little bit. Try something simpler like a spiffy collar. So Boss, are you going to play dress up with me? I am so not dressing up. That is like the last straw. Who invented this day? Great tips, Waff ..... But we still won't dress up. We're with Katie! We'll let you celebrate this day on our behalf, Waffles. 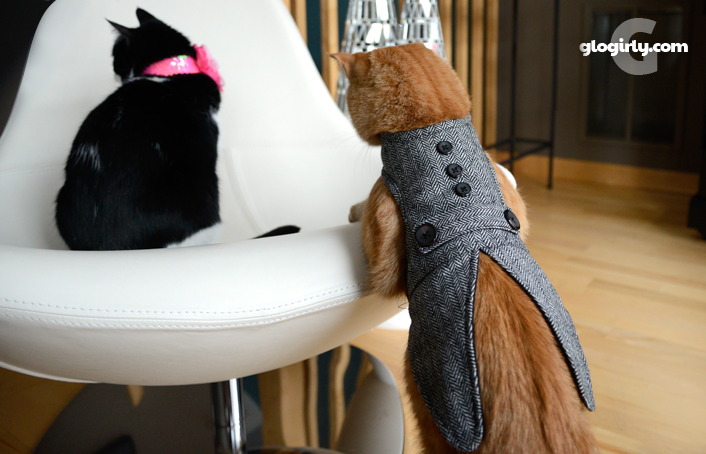 No attempt to get us to wear anything beside our collar has ever gone without bloodshed on the humans' part. This is one day we're glad the mom didn't know about. No dressing up for us. You're a good role model, Waffles. Richard won't even wear his ID collar! Waffles, I am not about to put any clothes on today or ever, but Mom and I think you look extremely handsome in your tailcoat. Oh my we are envious of your closet!! So handsome, Waffles! The ladycats are all going to come calling now! Pee Ess - We're printing those tips and leaving them for our mom to find. 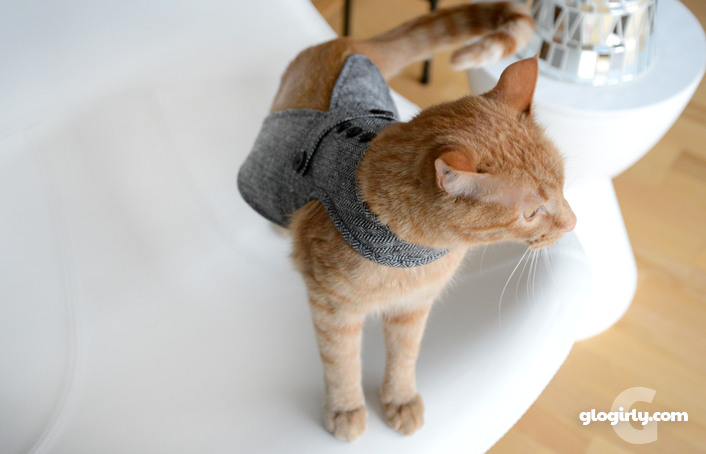 Excellent tips for kitty (or doggy) dress up! Waffles has quite a wardrobe, I'm jealous! Me luvs to weat meez cutesy clothes, and sis Lexi dusn't mind, but wuld purrfur it wuz me. MOL Yous look gweat Waffles and those awe sum purretty clothes Katie has. Sorry she dusn't like 'em. You sure are high stylin', Waffles!!! 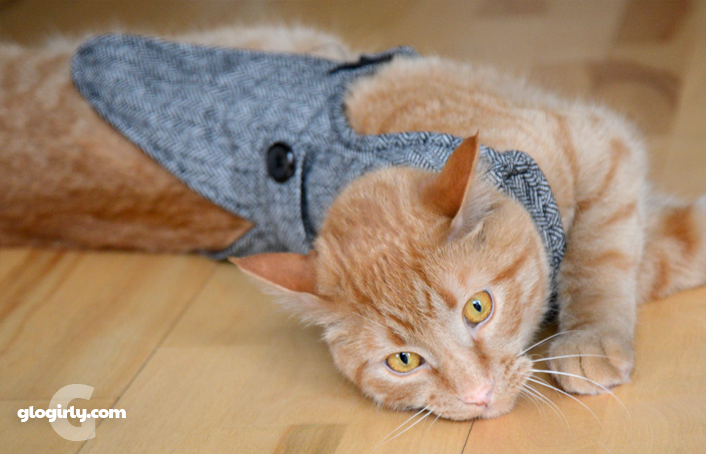 Waffles, you look quite dashing, but I don't even like wearing a collar. I will just go with my natural coat. You look soooo handsome in your coat and tails Waffles..
Waffles I love it when you dress up in your tails. You are so Handsome! None of the Squeedunk cats would allow me to play dress up with them, but if ever I were to try I will use all of your tips...they are Purrfect! Faraday: Not only NO, but HE--mmmmmpf! Maxwell: Just call me the FCC of cat blogs.